Gently mix the flour and butter with hands until a crumb like texture forms. Add the milk, diced apple, raisins and egg. Mix well, roll into a ball and leave in the fridge for 15 mins. Later, gently roll out the mixture to a 15mm thickness, cut into circles around 40mm in diameter. Grease a flat griddle pan or heavy frying pan and place over a medium heat. 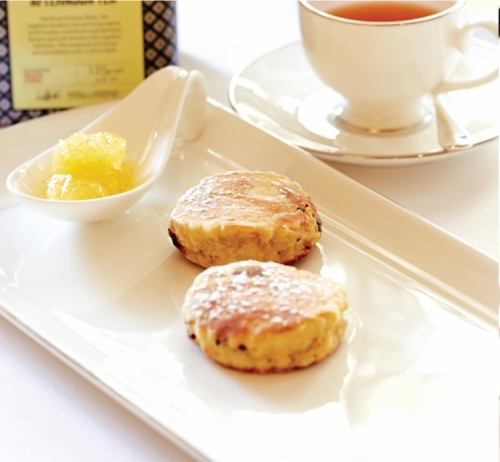 Cook the Welsh cakes in batches and cook gently until golden brown. Sprinkle with sugar and serve immediately with lemon curd (made by mixing the juice of lemons, sugar and Agar Agar in a bowl over simmering water and chilled).